It’s no secret that I’m a pretty stylish pup, so it comes at no surprise that one of the most common questions I get is “where did you get ______?”. So I’ve decided to compile a list of the must-have items that I’ve tested, love, and use regularly. Disclaimer: Please note that some of the links below are affiliate links. I use all of the products listed and recommend them because they are companies that I know and love. 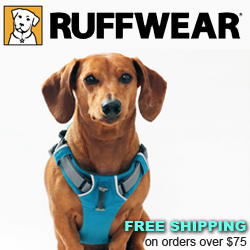 Ruffwear Frontrange Harness – I use this great harness as a walking harness and also a lot of times when I ride in the car. If fits me great and is easy to put on, plus the extra padding in the front is a great feature to have. It even has a spot in the back for id tags and identification! You can check out the review I did of the Ruffwear Frontrange Harness. Ruffwear Slackline Leash – this is my daily leash that I use for walks and when I leave the house. I love that it can extend or shorten to two different lengths, can easily be used to tether me if need be, and even has a handy loop for holding poop bags. It’s my favorite go-to leash for everyday use and has lasted me many years with no wear and tear. Read my review on the Ruffwear Slackline Leash. Ruffwear Roamer Leash – this is my go-to leash for extended walks and hiking. I love that it stretches to give me more walking distance, and is much safer than a zip leash. As a bonus it attaches to one of my parents for easy hands free walking and has a super strong “claw” clasp. You can check out the review my pal Shilah the Husky and I did of the Ruffwear Roamer Leash. Molly Mutt Fillmore Pouch – I use this handy pouch on several of my walking leashes. I keep my business cards (of course) and a roll of poop bags inside. Lounge Collars – when I’m laying around the house I sometimes don’t like to wear such a big bulky collar, so I grab one of these lounge collars from Blanket Id, Lasso Ropes, and Best in Show Leads. Id Tags – I keep a variety of pet tags on various collars including these; Blanket Id Pods, Tag Me Pet Tags, and Tags for Tails. Trax GPS Tracker – This GPS tracker easily attaches to my collar and according to my mom is a total life saver. I wear it every time I’m on the farm and also when waiting in the car while my mom runs errands. With a handy app that works on your phone you can track exactly where your pet is at any given time. Read the full review on how I love the Trax GPS Tracker. Wellness Trufood – This grain free dry dog food is part of the rotational diet that I eat. I have been eating the Wellness brand food since I was just a wee pup (and on the puppy formula) along with several other brands that I rotate to after each bag. Trufood launched in 2015, and I have since added it to my diet. Check out my full review on the Wellness Trufood Brand. You can also read more about how I keep fit and healthy with a combination of nutrition and exercise! The Honest Kitchen – Late 2015 I began mixing dehydrated food into my meals to get the benefit of the nutrients in raw whole foods. The Honest Kitchen is now one of my favorite brands and I anxiously look forward to meal time. Read my review on the Honest Kitchen’s Revel and their limited ingredient diet, Brave. 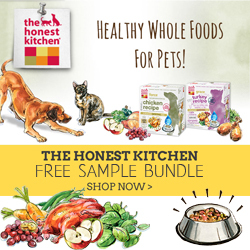 If you’d like to try some Honest Kitchen with your pets you can use CODE AMBBGKD6100 $8 off a 2lb. sample box. Plato Organic Chicken Treat – If I had to choose a favorite treat, these would be it. I was first introduced to them in one of my Barkbox subscriptions and they have been a favorite ever since. Mom pulled them out for the first time at one of my dog agility classes and I flew around the course at top speed to get my paws on one of these treats! I highly recommend them for training sessions, and I love that they are made from great ingredients. Bully Sticks – Sometimes I need something to occupy me during the work day. My mom always likes to keep a few bully sticks in our freezer (as it keeps them fresher). They are much safer than rawhide and keep me busy for a few extra minutes while mom’s trying to work. 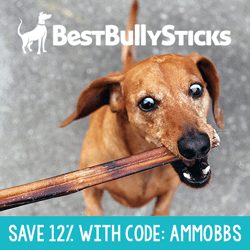 Most of the time I purchase them from Best Bully Sticks , but you can also find them at your local pet store. CBD Cookies – For several years now I’ve been using CBD cookies to help during stressful situations. CBD is a non-psychoactive cannabinoid that’s derived from all-natural hemp. It’s a concentrated, holistic remedy for anxiety, arthritis, nausea, inflammation, and other pain. I like to use them to help calm me during fireworks and thunderstorms as well as when I get worked up over things (like chasing bees, barking at bunnies or when people splash too much in the pool! It mostly just makes me a little sleepy so I can relax more. Grab a bag or try the oils from the Barkshop and use code AMMO for a special surprise at checkout! Affordable Pet Testing – In 2018 I was approached by a company that offered affordable and non-invasive hair testing for pets to determine sensitivities. I jumped at the chance to find out what sorts of things I should steer clear of as I had no serious allergies. When the results returned I noticed a few items I was already aware of that I had sensitivities to (turmeric, turkey, and seafood) and even a few surprises (horses, willow trees & mold). I found it insightful and helpful in determining what things I should come in contact less. You can learn more about Affordable Pet Testing on their website. Voyagers K9 Apparel – My yellow fleece jacket that I wear on the farm a lot is the most popular one people want to know about. I’ve had it for years and years and it holds up great to the rigors of farm life. I also own a raincoat and fleece from the same company that I love as well. It’s the toughest jacket I own, and I’m hoping it will last for many more years to come. Ruffwear Climate Changer – I love this fleece as it is one of the warmest fleeces I wear, and as a bonus it zips up instead of using velcro. I wear a size XS, and I did have to do a slight modification to this by shortening the legs (I just cut the leg holes shorter with a pair of scissors), but it does fit my body great in the length and chest. It’s great for indoor or outdoor use and I frequently layer it under other clothing. Noodle and Friends – I own several winter jackets (and even a fleece) from Noodle and Friends. These are designed to fit dachshund shaped bodies and their styles are oh so fun. I also love that they have a built-in D-ring so there is no need to wear a harness. Many of them are reversible and even come with handy pockets for carrying small items. Check out the ones I own: The Executive, The Blizzard Parka, and The Reversible Pea Coat. My Canine Kids Fleece – This fleece is great because not only does it cover my chest and belly, but it also has adjustable straps that can fit a variety of sized dogs. It does sit a little shorter on my back than some of the specifically designed dachshund coats, but it’s still extra warm. I like to wear this one in the fall or underneath a heavier coat while on the farm. Lime Green Sweater – my hand-knit lime green sweater is one of the staples in my wardrobe. I love to wear it in the fall as it adds just a little extra warmth for those chilly fall days. It is a little too delicate to wear on the farm, and does not include a harness hold. It was made for me by the Etsy Shop, By Chance Designs, and can be knit to fit a variety of dogs in many different colors. Ruffwear Summit Trex Boots – when we get bigger snow storms or have lots of ice I like to wear these boots on the farm as they have a little more traction and warmth. They stay on great on my back feet but I put a pair of Pawz boots under them on my front feet to keep them more secure. For bigger dogs there is no issue with them staying on. Check out the full review on the blog. Hurtta Summit Parka – After winning a contest I won one of these lovely winter coats from Hurtta. Even though it’s not specifically made for dachshunds it’s got a lot of adjustable features that make them great for fitting any sized dog. It’s extra thick and warm and I love that it protects my underbelly from the cold. I love wearing this coat on the farm to keep warm in the winter. You can fetch them on Amazon . Heat Lamp – I admit that I live a bit more of a pampered life. And in the winter months the shop I work at can get a bit chilly. So instead of freezing my buns off I love to relax under a heat lamp that my mom set up for me over my dog bed. You have no idea how nice life can be until you get a heat lamp! Bauer Pottery Food Bowls – these are so colorful and fun and the perfect size for me. I have a Bauer yellow and aqua bowl in the small size sitting on my kitchen floor at home. They clean up well and are handmade in California. They only thing that would make them better is if they had my name on it! Molly Mutt Dog Duvet – I have one of these hanging around in my kitchen for when I need to watch my mom and dad make dinner. They come in handy because they are easily removable and washable and come in lots of fun patterns. Charlie Be Good Duvet Cover – I have this lovely cover on my dog bed in our home office. It’s very well made and just oh-so-stylish. My mom loved it so much that she even went back and ordered a pillow cover in the same design and colors. They also make that super cool bowtie you see me wearing (I own two from them and they are great!) Read my review of my Charlie Be Good products on the blog. Dog Crate – every night at dinner I go into my crate and enjoy a yummy toy stuffed with peanut butter. This one is strong and secure but still allows me to easily see out. Admittedly I’ve never been a big fan of the crate, but over time I’ve gotten used to it, and now it’s part of my routine each night. Just don’t expect me to be spending the night in there anytime soon! Benebone – my very favorite long-lasting chew toy that comes in several flavors and two sizes. I’ve tested out the peanut butter, chicken, and bacon flavors and it’s always one of my go-to favorites at my house. I’m a tough chewer and it’s hard to find toys that aren’t destroyed in mere minutes (and ones I actually like playing with). This one lasts a long long time, although because of my short legs I’m always begging someone to help me out by holding the end for me! Planet Dog Raspberry & Strawberry – these toys last a long long time and I love when my parents fill it with peanut butter. All the planet dog toys are made a tough rubber that is great for tough chewers. Pickle Pocket – the pickle pocket is a tough rubber toy (in a pickle shape) that has slots for stuffing treats into. It’s durable and great for keeping your dog occupied. It’s a definite must toy for those tough chewers out there and is even safe in the dishwasher. I love that it makes stuffing with standard cookies quick and easy. Read my review of the Pickle Pocket on the blog. Flirt Pole – this is actually a home-made toy that I LOVE! It’s essentially a dog toy tied to a pole that mom and dad use to play with me. It’s one of my favorites and really kicks in my prey drive. You can read the tutorial I created and make one for your dog, or purchase one online if you aren’t the do it yourself type. Either way your dog is going to love it! Booster Seat – I love this booster seat because it gives me a great view out the car window and even has an added heater in the seat to keep it warm in the winter months. But the real reason I ride in one is because it has a seat belt attachment to keep me safe in the event of an accident. I did upgrade the original seatbelt tether it came with to this one , but it still works great! Read my review of the K&H Bucket Booster Seat. Travall Guard & Divider – In the beginning of 2019 my family traded in our fairly roomy Ford Expedition for a smaller Toyota Highlander. Little did they realize that with the downgrade in trunks space I could suddenly reach everything…this included groceries! I got my fill of lunch meat, cheese, and I even snagged some McDonald’s! My food stealing days came to an end when mom installed the Travall Guard and Divider. It keeps me safely contained in my booster seat (which got installed by attaching to the guard with a bungee) and away from groceries, or anything that could fall on me while traveling. It also makes it a lot easier to pack for long road trips too. Sleepypod Click-it Sport – on long distance trips I love to wear this harness as it’s been crash tested and rated the top safety restraint for pets on the market. I don’t use it every day because it’s a little more cumbersome for me to walk in, and I don’t like having to switch out harnesses all the time. My buddy Trooper wears his every day in the car and as a walking harness as well because it fits his bigger body a lot better. Sleepypod Yummy Bowl – I love this travel bowl and keep it with me in the car all the time. It’s great for bringing along a meal on the go as well as your water too. It comes in handy for lots of travel situations and even has a special feature to keep ants out of your dog’s food when camping. The bowls are also dishwasher safe and can even be frozen! Read my full review of the Yummy Bowl on the blog. I always make sure to wear my life vest in and around the water in the summer. The Ruffwear Float Coat is the best fitted floatation device I have ever worn for my hard to fit dachshund shape. It has handy attachments for leashes & even a safety light. Check out my full review on my blog. Portable Fan – During the summer months I always keep this portable fan in my car. Sometimes I use it while camping, and other times I turn it on if my mom has to run a quick errand and I’m hanging in the car. Canon Rebel T3 – my go to camera for most of the photography you see on my blog is this camera. It’s a great entry level digital SLR with many auto and manual features. It can even shoot video and can be enhanced by adding additional lenses. It is lighter weight and fun to shoot with. 50mm Lens – dubbed the “nifty fifty” lens, this portrait lens gives my photos that great blurred background look. The f/1.8 speed makes it perfect for available-light shooting. It is both compact and affordable and is the lens I keep on my camera the majority of the time. Canon EF-S 17-55mm f/2.8 Lens – this wide angle zoom lens is perfect for a variety of different shooting environments. Large aperture produces shallow depth of field (and gives you that pretty blurred background look) and it’s wide-angle zoom allows you to capture much more of a scene. Definitely one I plan to keep in my camera bag for a long time. Telephoto Zoom Lens – this lens works great with my Canon SLR and is perfect for shooting action. I tend to use it on the farm the most or for horse events or sports events. Eyefi Mobi SD Card – this SD card is a total time saver when paired with my Canon Digital SLR. It is able to create it’s own wifi network and allows you to instantly upload photos taken on your SLR directly to your phone. It makes posting to social media super fast and easy! Paired with a photo editing app it makes taking and posting professional quality photos a breeze. iPhone 7 – many of the photos I post on the go onto my social media sites are taken with the iPhone 7. I’ve always been an apple person and this phone is easy to use and takes amazing photos. It also has slow motion and time lapse features that come in handy for the blog. It’s big screen makes it easy to preview photos and having a smart phone with me 24/7 makes updating my social media a breeze. Photography Lighting Kit – I recently added a basic lighting kit to my photography supplies. This continuous lighting kit comes with 2 large stands, 1 mini stand and two umbrellas. They also come with bulbs, but I immediately upgraded mine to higher wattage bulbs for more light. I use this set frequently to take product shots and in the colder months when it’s too cold to use natural light outside. Photo Back-up – Because making sure I never ever loose the THOUSANDS of photos I take for my blog on a daily basis is so important I use BackBlaze to automatically back-up all the files on my computer. BackBlaze runs in the background and makes sure in the event that my computer ever crashed I wouldn’t loose all those adorable pictures of myself! Saw me using something you don’t see on this list? Just shoot me an email at info@ammothedachshund.com and ask!